The Bride Of The Red Sea (Episode XVIII) : The 2014 Umrah (Part 3) – Tongue Duelling The Arabian Daddy @ 3rd Pilgrimage of Tanai’m As Miqat & The Depth of A Mother’s Love! After a whole day cooped inside the room , nursed by Mak (Good Lord! I was so thankful for having Mak with me and touched. This journey really bonded us and a testimony of how a Mother will go to take care of her child. I guess it was God’s way of showing me that. 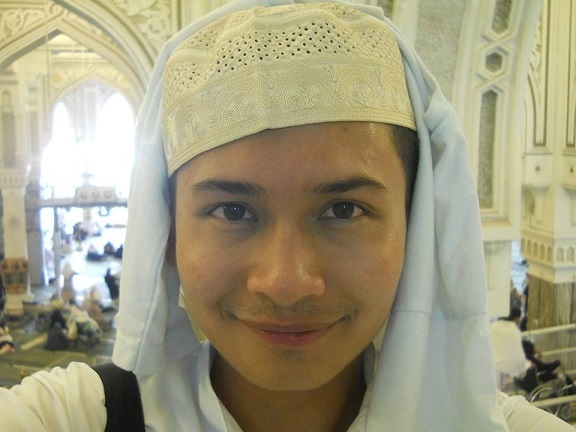 Alhamdulillah) as I was having REALLY bad cough (REFER to https://undomiel84.wordpress.com/2014/06/29/the-bride-of-the-red-sea-episode-xvii-the-2014-umrah-part-ii-the-tale-of-habatus-sauda-2nd-pilgrimage-with-jaaranah-as-miqat-visiting-jabal-al-nour-jabal-ar-rahmah-arafah-field/ for details!) and couldn’t sleep; I finally felt better, Alhamdulillah! All thanks to the cough syrup and also Habatus Sauda’ I consumed. Luckily with that, Mak & I were able to join the Andalusia Travel & Tour’s entourage to perform our 3rd Umrah with Miqat at Tanai’m, another famous Miqat for Mekkah residences to don their “Ihram” and unified the Intention or “Niat” in order to perform Umrah or Hajj. 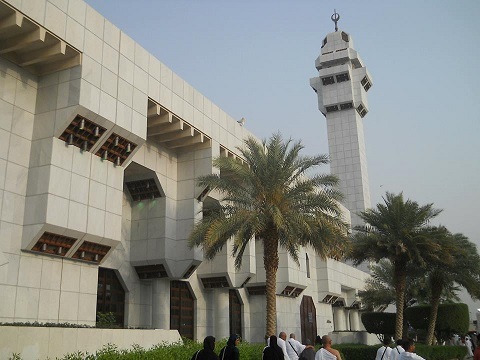 The Tanai’m Mosque or affectionately also known as The Aisha/Ayesha Mosque. I was pictured up there in front of the boundary between Haram Area & Halal Area. Tanai’m is considered as the nearest Miqat to Makkah, approximately around 8 km from it. 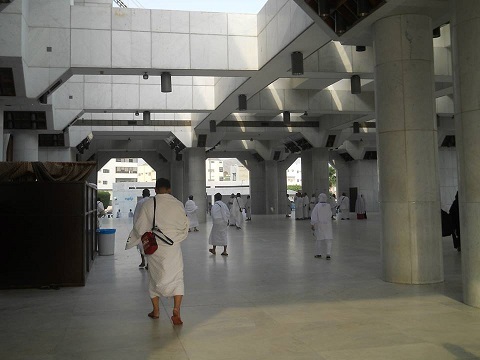 The mosque also sometimes is known as The Aisyah/Ayesha Mosque as it was reported that Prophet Muhammad SAW’s wife, Aisyah R.A donned her “Ihram” in this very Miqat before entering the Haram area heading towards Baitullah. It is now quite a big mosque and spacious. 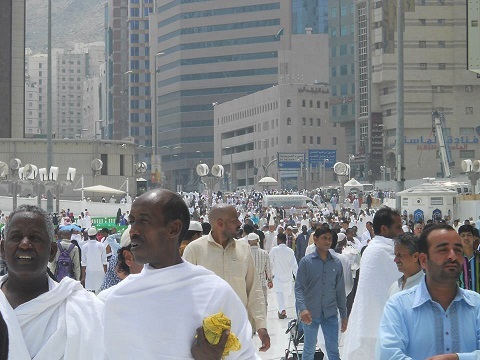 After taking ablution/Wudhu’, all of us had to change into “Ihram”. Since there were so many of us, we had to change in the praying area altogether with other entourage from different countries and agencies. 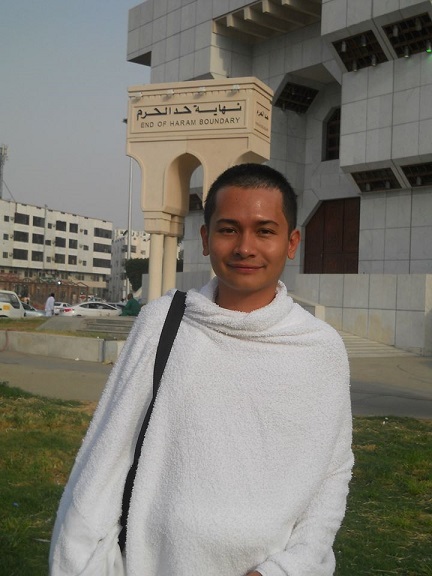 Performed a “Sunat Ihram” prayer and then off to Baitullah! We successfully performed our 3rd Umrah and it felt great to be able to execute that, Alhamdulillah. The inside-deco scene of Tanai’m Mosque. 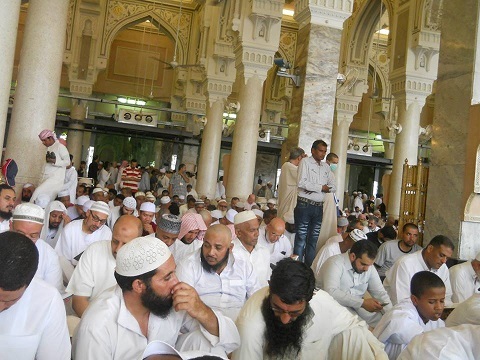 Anyway, on Friday 6th of June 2014, I had the chance to perform Friday prayer at Makkah. Since Friday prayer is only compulsory to male as well as our hotel was 650 meter away from Baitullah, Mak resorted not to join the Friday prayer; so, I went there alone. Zuhr/Friday Prayer time was slated around 12.30 p.m. but I went there earlier circa 11.30 a.m. because I was told that the crowd thronging in the mosque will be immense! I mean, what do you expect? It is Islam’s holiest place! So, I went there and as I expected, the crowd was already thronging the compound of the mosque!! Tanai’m Mosque with its spacious compound. 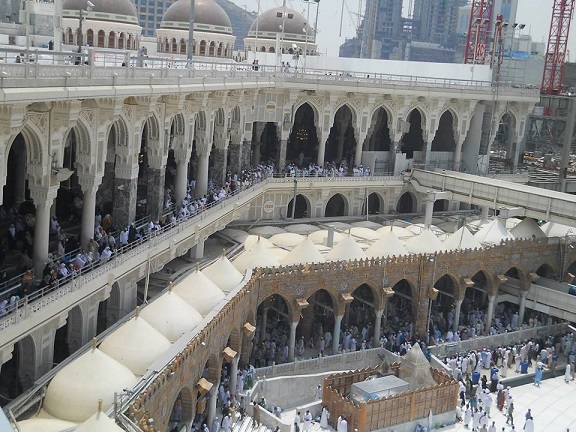 The immense crowd thronging the Baitullah everyday; and how do you imagine Jumaat Prayer would be like? DOUBLE! I like this shot. 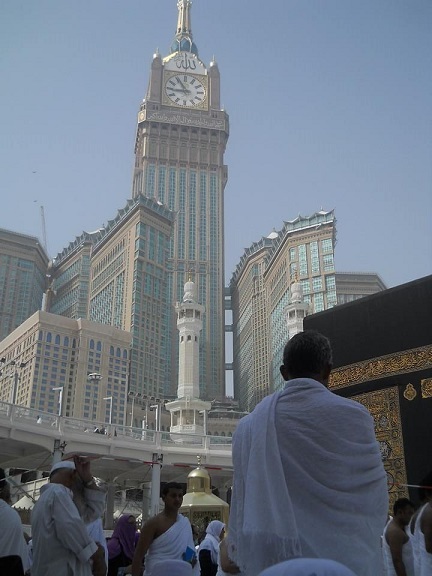 Kaabah & Zam-Zam Tower visible from point of view of me sitting on the Kaabah’s mozaic; after performing Tawaf Prayer. 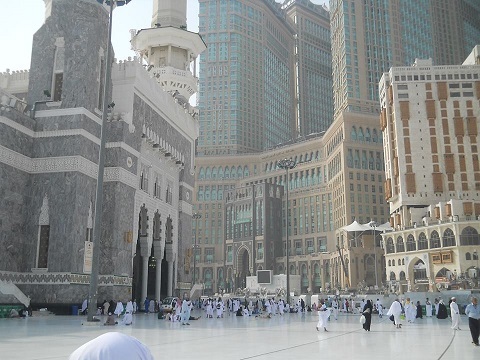 Rapid growth of hotels and gigantic architectures engulfing The Baitullah. 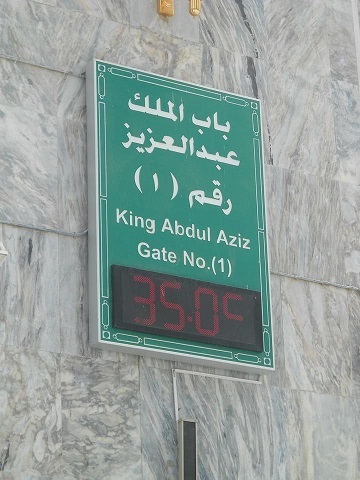 35 Celsius and that can be considered as quite low in Saudi Arabia! NOW, this was what happened. Right after I had finished my “Sunat” prayer, SUDDENLY, SOMEONE SLAPPED OR RATHER THUMPED MY RIGHT BACK SHOULDER!!! OUCCCHHHH!!!! I was so furious and shocked at the same!! Who did that??? So, I turned my head to the right side and saw an Arab man who sat at a Saf (prayer line) behind mine, probably around the age of 30-40 years old BEGAN TO RAMBLE AND USING ANGRY HARSH TONE TOWARDS ME IN ARABIC!!! At first I didn’t understand but when I saw his hand jerked towards the Arab boy who say behind at my left handside, I got his message. HE WAS SCOLDING ME FOR NOT GIVING SPACE TO HIS BOY!!!!!!! 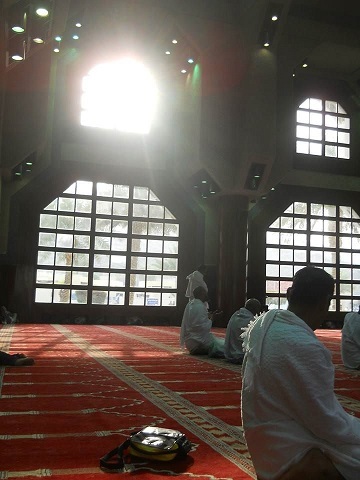 The atmosphere at the 1st floor of Baitullah. Where the argument took place between me and the Arab daddy! Hahaha, “daddy” sounds so scandalous isn’t it? LOL! I purposely screamed the Arabic words of “House of ALLAH”, “Masya ALLAH” & “ALLAH Hu Akbar” so that my message would be registered to his mind if so happened that he didn’t understand whatever I said in English! Now, the tactics sorta worked because after he heard that, he was recoiled a bit AND everyone around us trying to cool us down and even tried to persuade me to relax. Well, I kept rambled and rambled and rambled until in the end, the people around make a gesture indicating to me that I could just sit there and ignore the commotion! Hahhahaa, serve him right!!! With rather a vain gesture, I turned my head off to the Qibla’ direction, ignoring the father BUT I did try to make space for the boy to squeeze in. Nevertheless, the boy make signal that it was OK; perhaps after watching me battling orally with his father! Hahaha! I am not sure why but I saw A LOT OF CATS in Baitullah and Haram Area. I don’t know whether it is coincidence or not but I felt that it was like God’s sign of showing me because I like cats and been rearing 5 kitties these days! Mystical, isn’t it? 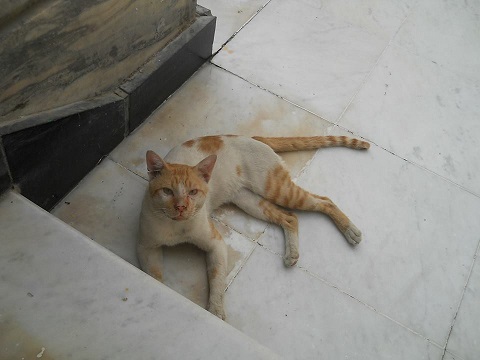 After all, cats are revered animals in Islam and Prophet Muhammad’s favourite pet. Actually, I fully understand this. The Arabs really love their children and that is why you could see them bringing their children to pray in Baitullah and recite Quran there. AND of course, I would try to give space to the boy BUT when the father suddenly THUMPED my back, would I just be submissive Asian to the so-called “superior” Arab? NO WAY!!! I ain’t going to be submissive! But after the incident, I definitely recite “Istighfar”…..! Hmmmm…perhaps it was God’s test for me but I felt that I just can’t pretend to be the submissive Asians, fooled by the Arabs. I need to stand up! 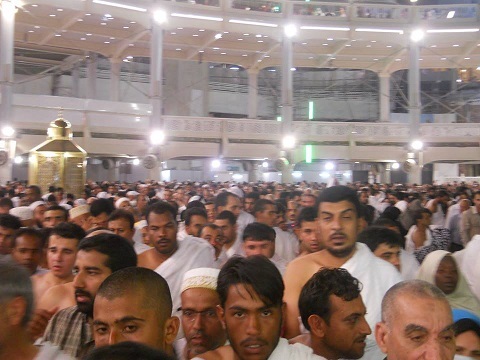 The scene during Tawaf or circumambulation. 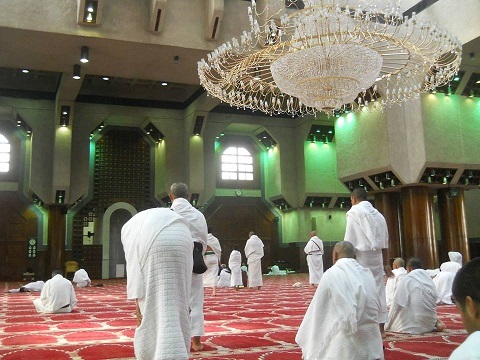 This exclusive experience really illustrated the impressions I have always been fed before I went to Haramain that the Arabs could be very harsh and different from us, the demure and polite Asians. When we, Asians want to pass through people who are praying, we would gently tap the shoulders to signify the “permission to go through” but not the Arabs; they would just harshly PASS THROUGH you and sometimes even in an unapologetic manner of pushing you! Of course this is part of Umrah & Hajj test of patience and of course, we are not to talk ill about Arabs as they are after all the race of Prophet Muhammad SAW. But, would we Asians succumb to the harsh attitudes? NO, someone gotta stand up and say. After all, God SWT creates no race superior than others. And the Arabs should remember that. “If it isn’t because of Kaabah which is the focal points for all of us Moslems, and the Prophet Muhammad SAW’s grave in Madinah, who would want to visit here? With the scorching hot weather and the harsh unethical Arabs? BUT we can see that is the reason why ALLAH SWT descended a messenger from the Arabs to shepherd them and subsequently to all of us. Because they were uncivilized and had / have no manners; and that is why Islam emerged; to assuage the Jahiliyiah”. I guess it is true that if you seek the beauty of the religion, NEVER look at the followers as they tend to abuse and paint bad image of the religion due to their ignorance. See the religion per se and the elements within, and you will be enthralled by the beauty. Subhanallah! In the Baitullah after Friday Prayer. Hahaha, it was a white cloth I put as the head covering because it was scorching hot! Some people said it looked like the head uniform of Arabian stewardess ala Saudi Arabian or Emirates! Hahhaa, that’s funny! ← The Demise of Malaysian National Nightingale, Datuk Sharifah Aini. Semasa di Makkah, kami sempat buat dua kali umrah lagi. Ini ialah umrah sunat. Untuk setiap kali umrah, kami kena pegi keluar dari Makkah (Tanah Haram) untuk ke Tanah Halal untuk pasang niat umrah. Ada dua kawasan miqat yang paling hampir dengan Makkah dan untuk tujuan menimba pengalaman, kami dibawa ke kedua-dua miqat ini. Miqat untuk umrah kali kedua kami ialah di Tana’im. Ini ialah miqat yang paling dekat dengan Makkah. Juga dinamakan Miqat Aishah kerana Saidatina Aishah bermiqat di sini. Kami miqat di Masjid Saidatina Aishah di situ. Ridhwan : Labbaikallah syarikala kala baik……..